The medical name for this fungal skin disease is dermatophytosis. There are many different types of dermatophytes. Microsporum canis is the name of the dermatophyte involved in most of our pet ringworm cases. Skin problems caused by the ringworm fungus are usually mild and short lasting, but every once in a while the disease can be severe and very difficult to cure. This disease is spread from human to human, from pets to humans, humans to pets, and from rugs and furniture to pets or humans. 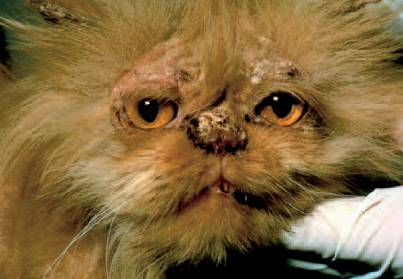 Dogs, rabbits, guinea pigs, ferrets, and all kinds of pets can be carriers and/or victims of ringworm, but ringworm is most common in cats. Long haired cats seem to be especially prone to getting ringworm. 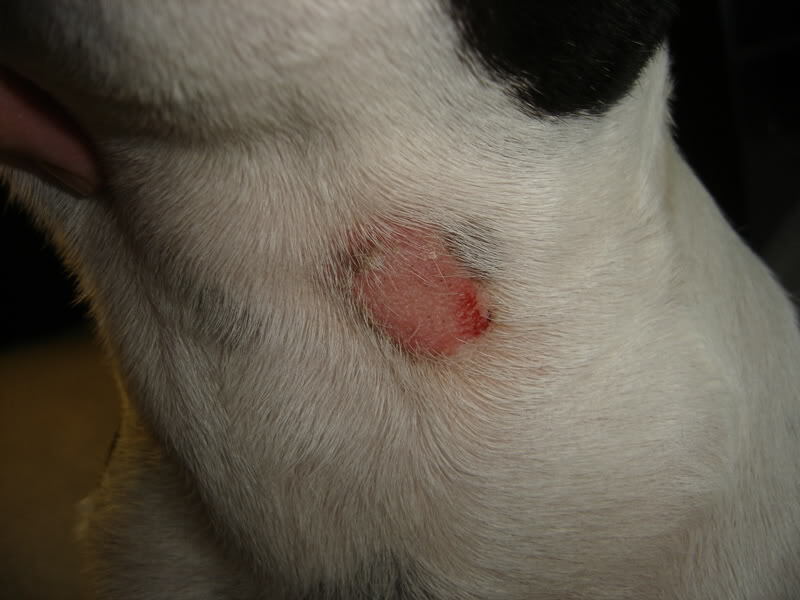 Ringworm is contagious from pets to people .... AND vice versus. Most people aren't all that susceptible. Anyone can get it, but children and women with fair skin seem to be especially likely to be badly affected. It's important to culture out suspected cases of ringworm. Modern culture kits will confirm the disease and also tell us which subspecies of the fungus is present. Treatment type and duration are affected by the results. 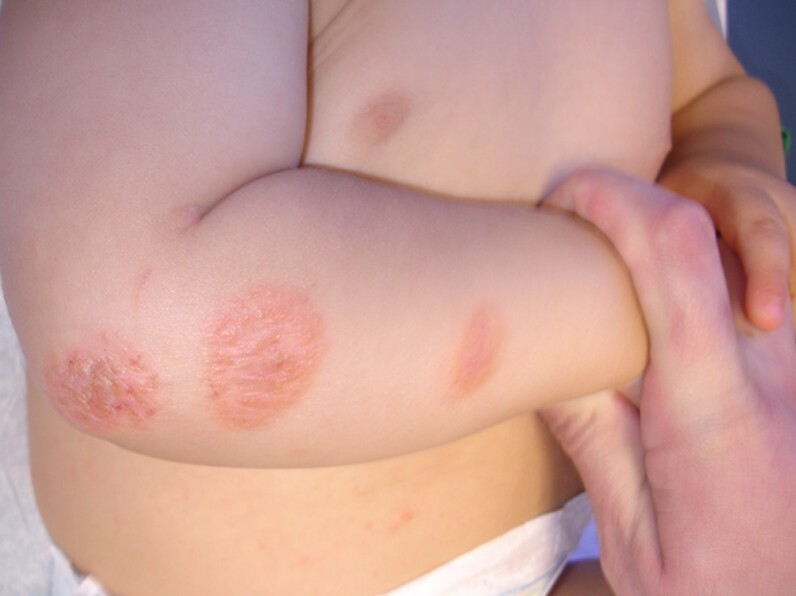 If you associate ringworm lesions as being circular zones of reddish skin irritation you are right SOME of the time. The picture of the cat above is also a typical presentation. The picture of the dog below does have a nice circular lesion. 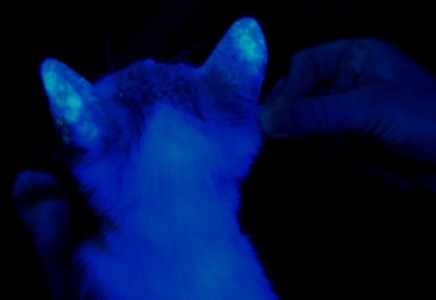 Wood's Lamp Fluorescence: Sometimes ... often ...but not always... pets with ringworm will fluoresce under a black light. Dermatophyte Culture: This is the most reliable method for the definitive diagnosis for the presence of ringworm organisms. Microscopic Examination: The presence of infective spores on hair shafts can sometimes be seen under the microscope. Some animals show no clinical signs of infection but may carry infective spores on the fur and skin. Clipping to get rid of the fungal spores is important in serious cases of ringworm. Topical Treatment with Zymox shampoo, Miconazole shampoo, ketoconazole shampoo or lyme sulfur dip are often curative. For minor cases, topical treatment with antifungal creams often work. Program, a brand of flea control medicine is sometimes used off label for ringworm. I don't know if this is effective or not. griseofulvin, Terbinafine, and itraconazole are sometimes used and needed. 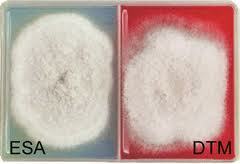 But there are potential bad side effects with antifungal medications so we have to be careful with their use. House cleaning; some cases are so difficult to cure that extensive cleaning of the environment is needed to remove fungal spores. Because of the No Kill Pet Shelter attached to our practice, we see a lot of ringworm cases. Lately we have had remarkably good success treating these cases with our laser. Class 4 lasers have just been (2013) approved in the United States for the treatment of toenail fungus in humans.